So, you're headed to Oahu and you want the scoop on what you should see. Not the tourist scoop, but the local places to check out, right? We just returned from our two week trip to Oahu for my grandma's 90th birthday. I was born and raised there, so it was great to be home again. 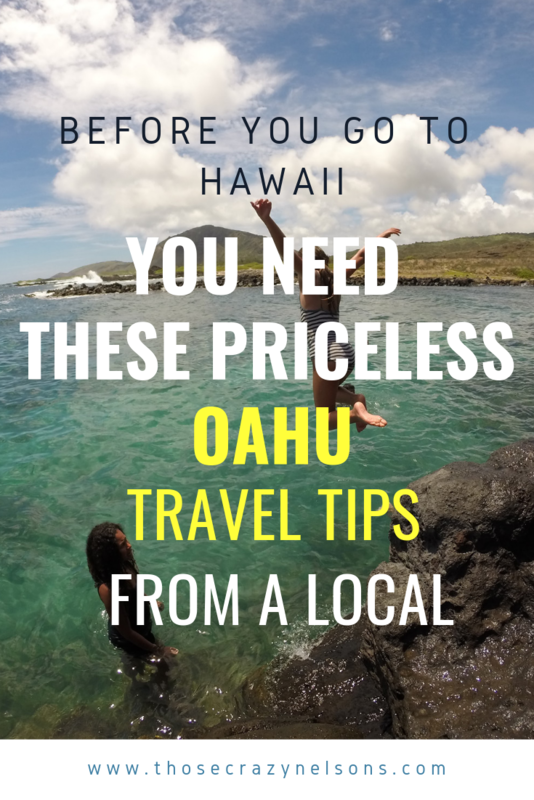 Here are just some of our Hawaiian travel tips. There is so much to do. Don't forget to relax and enjoy yourself. And don't get caught up in *doing* too much. Pack a carry-on. This is Hawaii, you won't be wearing much: a bathing suit, a nice outfit or two, and a couple of shirts/shorts. In Hawaii, people don't dress up. Jeans are fancy. Save your baggage fees. Bring snorkeling gear from home. If you have gear at home, even just a mask or goggles, bring it. Save some money; throw it in your carry-on. Try all the food! Go into a grocery store and be adventurous. Try the different snacks you see: li hing mui, poi, shrimp chips, poke, taco poke, mochi, manapua, etc. Try it. You'll be glad you did. Even if you don't like it, you'll be experiencing Hawaii through your taste buds. Respect the neighborhoods. A lot of the entrances to beaches and hikes are entered through smaller neighborhood areas. Be careful where you park and be sure to read parking signs. It's easy to get towed when visiting these locations. Be considerate of the sea animals you meet. I met a woman who was enthusiastic about showing her daughter the sea creatures in the tide pools. She was catching animals like sea cucumbers and sea urchins and dumping them onto hot rocks and leaving them there. Enjoy the wild life, but be courteous and return them to where you found them.